Another winter day in the Chicago brings about snowstorm. Two weeks into February, the Chicago Sun Times reports that we are already over budget for snow removal. 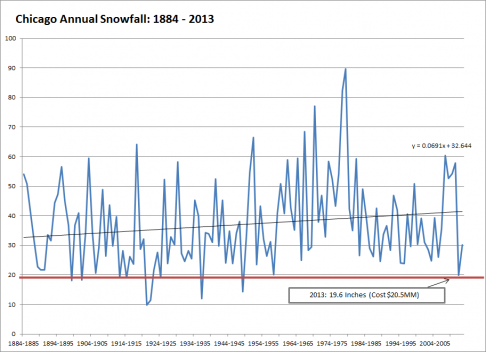 While the mayor can claim this is due to inordinately high snowfall, it’s really due to inordinately poor planning. Here’s how we came to a budget this year: we took last year’s number, $20.5 million, and stuck that in for this year. Why is that ridiculous? 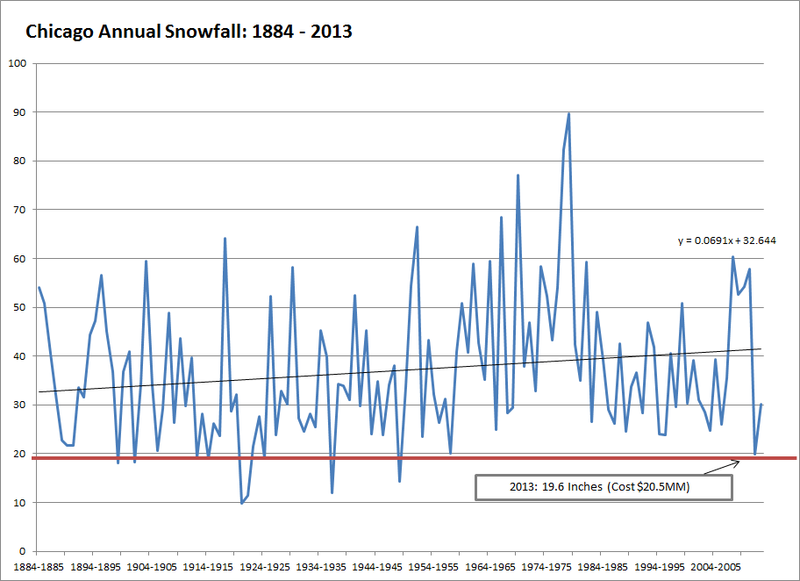 2013 was the lowest in recent memory for snowfall at 19.6 inches. The red line is the budget. The black line is the expected. 1 There’s a bit of a ‘volume discount’ that would likely drive the number closer to $40 million. As a follow up to last year’s analysis of crime in our neighborhood, I’ve put together a time-lapse heat map of robberies from 2008 through full year 2013. As noted before, the number of robberies in the 19th district is relatively static. However, the trend is a consolidation in a small block that contains the Boystown and Wrigleyville neighborhoods. This trend continues in 2013; the Belmont red line stop is the singular remaining ‘hot spot’. 2013 robberies (n=525) centralize at the stop and radiate out. In 2012, the ‘heat’ was more evenly distributed throughout the Halsted / Wrigley / Belmont triangle.1 In 2008 (n=532)2, the robberies were spread more evenly, including the Wilson and Lawrence stops (near the ‘Uptown’ label on the map). The CWB blog documents some of the potential causes. It’s worth following if you live in or around the area. 1. Of note, the 2013 green area does push east of Halsted (into residential streets) to a greater extent than in 2012. 2. Source: City of Chicago. N value may differ from published crime stats if exact location was not provided or miscategorized.